Double gables, a gabled dormer window, and a cozy front porch generate enormous curb appeal for this narrow lot family home. A formal dining room, accented by columns, is located directly off the foyer, while a generous kitchen with sizable pantry is open to the vaulted great room and sunny breakfast area. An L-shaped back porch creates a comfortable spot for outdoor relaxation. 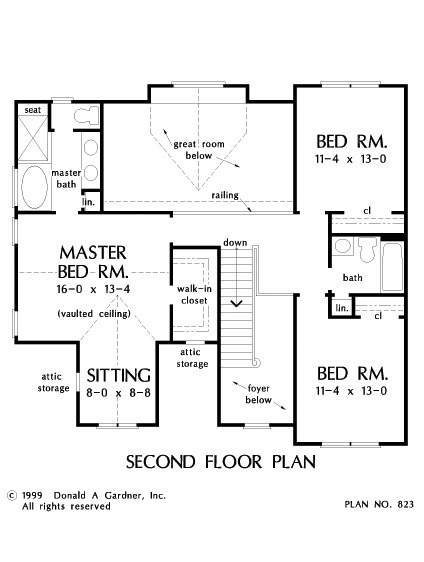 The master suite and two family bedrooms are located on the second floor. 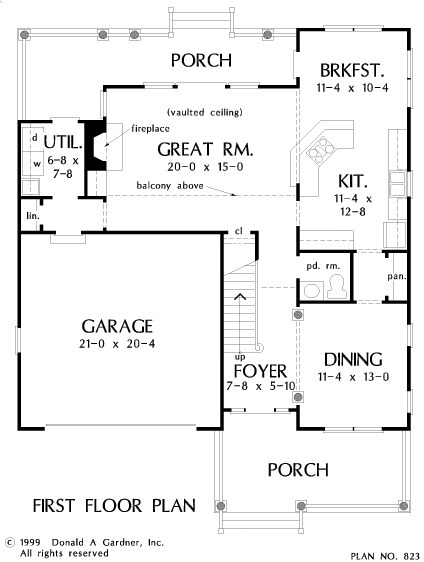 The master suite has a vaulted ceiling, luxurious bath, walk-in closet, and dormer alcove sitting area. The upstairs hallway dramatically overlooks both the foyer and great room. 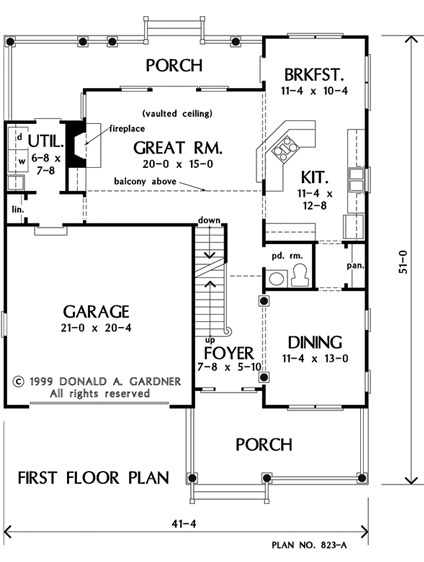 1st Floor: 1083 Sq. Ft.
House Dimensions: 41' 4" x 51' 0"
Great Room: 20' 0" x 15' 0"
Foyer (2 Story): 7' 8" x 5' 10" x 18' 0"
Great Room (Vaulted): 20' 0" x 15' 0" x 17' 0"
Kitchen : 11' 4" x 12' 8" x 9' 0"
Breakfast Room : 11' 4" x 10' 4" x 9' 0"
Utility Room : 6' 8" x 7' 8" x 9' 0"
Garage : 21' 0" x 20' 4" x 0' 0"
Master Bedroom (Vaulted): 16' 0" x 13' 4" x 14' 5"
Bedroom #3 : 11' 4" x 13' 0" x 8' 0"
Porch - Front : 20' 8" x 8' 8" x 0' 0"
Porch - Rear : 29' 4" x 6' 0" x 0' 0"
Balcony : 12' 8" x 3' 8" x 8' 0"
Other : 8' 0" x 8' 8" x 8' 0"